Wassup Hip Hop headz ! 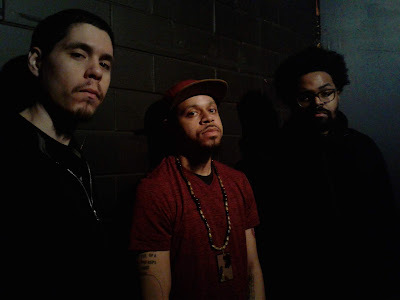 We had the great opportunity to interview one of the best underground and independent Hip Hop band Snowgoons before the release of their brand new LP "GoonBap". Check it out. First of all, how did you start your Hip Hop career back in the days and why ? Illegal: Since I can remember i was in touch with music. I didn't even play lego as a kid without having a tape of music playing to it. On those tapes it was all random music from my uncle but songs from Grandmaster Flash or Run DMC were my favorite before i even knew that it was Hip Hop. I never planned on making a career in music because I just had fun with it when I was playing some records on the turntable. Thats how I started in the early 90's as a DJ. Same time i was active as a B-Boy and Graffiti Artist. By the way, thats where my name Illegal came from. Because back then people didnt know much about Hip Hop or Graffiti but then knew Graff was Illegal so they called me the Illegal one. 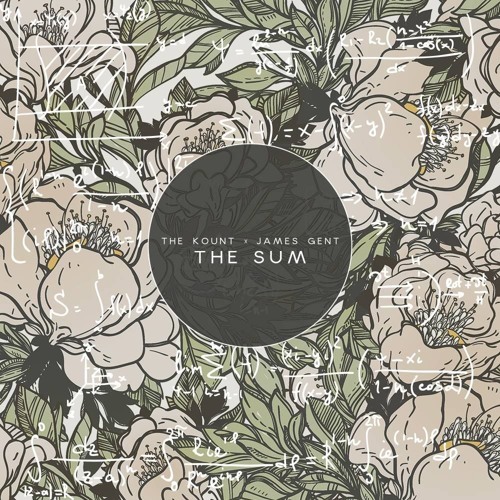 You’ve done countless collabs over the years, mainly with MCs from the US but also from Europe. 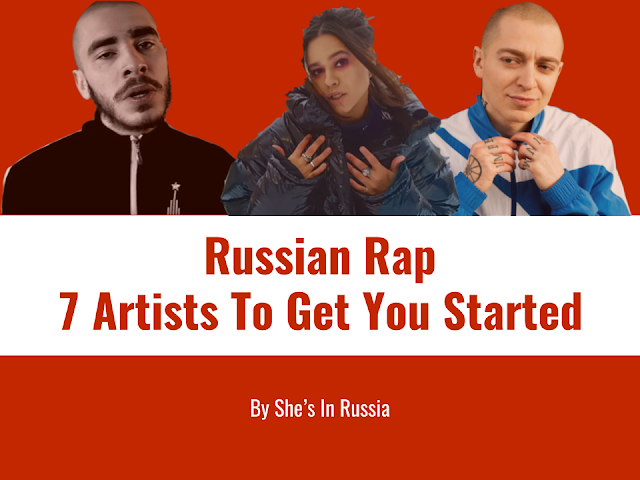 Are you planning on collaborating with other european MCs in the future ? Illegal: Of course. Hip Hop has no boundaries and we will work with many artists outside the US. Hip Hop nowadays is big in a lot of countries and thats the best part about it - It connects people worldwide ! For example, your LP with killakikitt is an absolute banger ! Do you plan on working with them on a track/LP again in the future ? Illegal: Absolutely yes. KillaGoons 2 is already in progress. Stay Tuned. Being a producer myself, I can understand the struggle you guys go through when making a production for an MC, how do you proceed generally? Illegal: Today we are in a way better position meaning a lot of artists have respect for what we're doing and we can actually suggest or even request special topics, and the other way around. Most artists just tell us what they are looking for. They name some older songs from Snowgoons so we get an idea in which direction the Artist wants to go. Your productions are pretty recognizable and unique, people can feel it when they hear them. What would be « The Snowgoons touch » according to you ? Illegal: Like you said, people can feel it so it's mostly up to them but I know what you mean. I guess overall you can say, beside the obvious hard drums and boom bapish style, we use a lot of melodic samples be we like melodies. 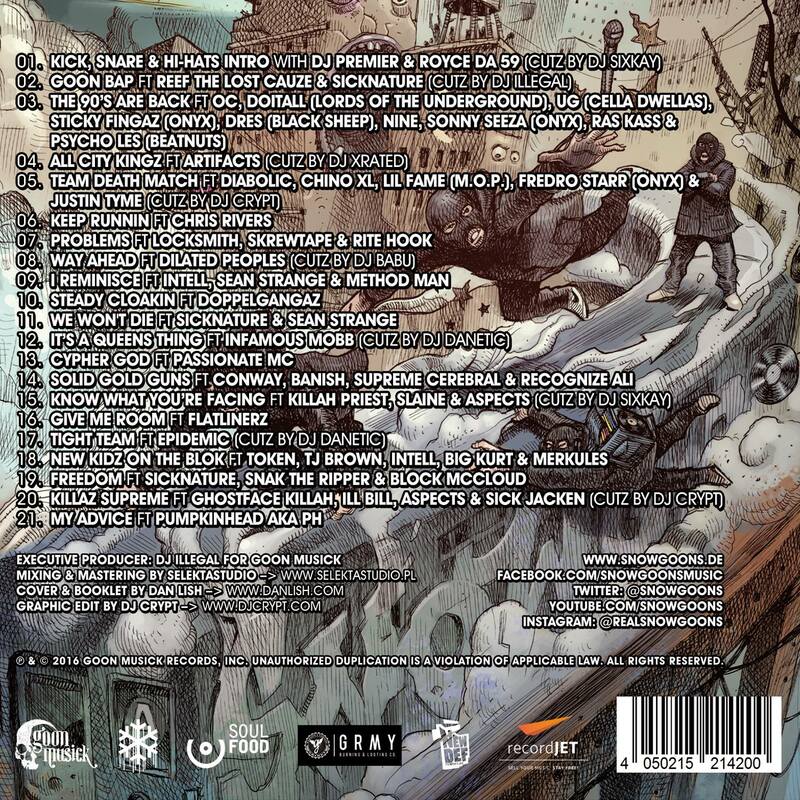 I think thats a typicall trademark of the Snowgoons even with Sicknature having his own trademark sound. But it goes very well with what we all do in the crew. Over the years I think all the unique parts of Snowgoons with Sicknature, JS Kuster, Det and myself found a way to collaborate together on some music and make it still sounds like Snowgoons if that makes any sense. On a more technical point but still related to production, what's the dopest instrument to use when you produce ? Illegal: We are heavy sample users so whatever you just feel and like as far as the sound goes. Thats the beauty of sampling, you find something and you make your own "Instrument" out of it. But yeah I know JS Kuster and Sicknature use some plug-ins too. Even real Instruments make it to some of the beats. Let's get serious and talk new bangers, you recently launched a trailer for your new album « Goon Bap » planned to be released on the 12th of December 2016 ? Can you tell us a bit more about this LP ? Illegal: Thats correct 12.12.2016 is the release date on Goon MuSick. We put all our love for the music in one Album and since we all are from the 90's era it's some sort of homage to the 90's hip hop without just trying to sound like it. 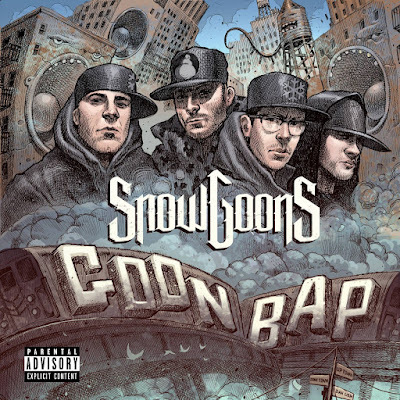 You might feel the heavy influence but after all we sticked to the classic Snowgoons sound. And we tried to track down some rare features and Artists we never worked with before. There are definitely some surprises coming up. You recently tweeted that Big Kurt will be featured on this new LP. Can you already tell us who else's going to be on it ? Illegal: Yes the new Goon MuSick Artist Big Kurt will be featured on a crazy track called New Kidz On The Blok with all new cats. TJ Brown 15 year old bronx rapper and co star of The Get Down Netflix show will be featured on this song as well. The Cypher God Passionate MC will be featured on it too right ? Illegal: Also correct. Finally after all this time we met and made it happen. There is a crazy story to it. R.A. The Rugged Man tried to link us some years ago and when he told me about Passionate MC I looked him up but I misunderstood the name and i looked up some weak rapper with a similar name. And I was like "what? Why would R.A. tell me this guy is dope ?" So I ignored it, and next time, again R.A. told me you have to check him out. Finally he showed me a video from Passionate MC and I was like "Hell Yeah!" The rest is history. Watch our for more with Passionate and the Goons! Like you guys said, this album will be a massive throwback to the Golden Era, which is incredible ! what made you decide to do so ? Illegal: I think its safe to say we ain't really happy with a lot of those new Artists. Of course Hip Hop is constantly evolving and there is always a right to exist for other styles of the art. But nowadays you have kids calling themselves "Hip Hop" and they don't even know anything about the roots and architects of this culture. You dont have to be a total old school or 90's head and know every Artist or every Song. But if you want to be a part of this culture at least show some respect and look up some milestones in this game, from Illmatic to Wu Tang to The Message just to be very brief. With that being said we hope to get some younger kids on the 90's tip and B headz like us just enjoying the good old golden sound. 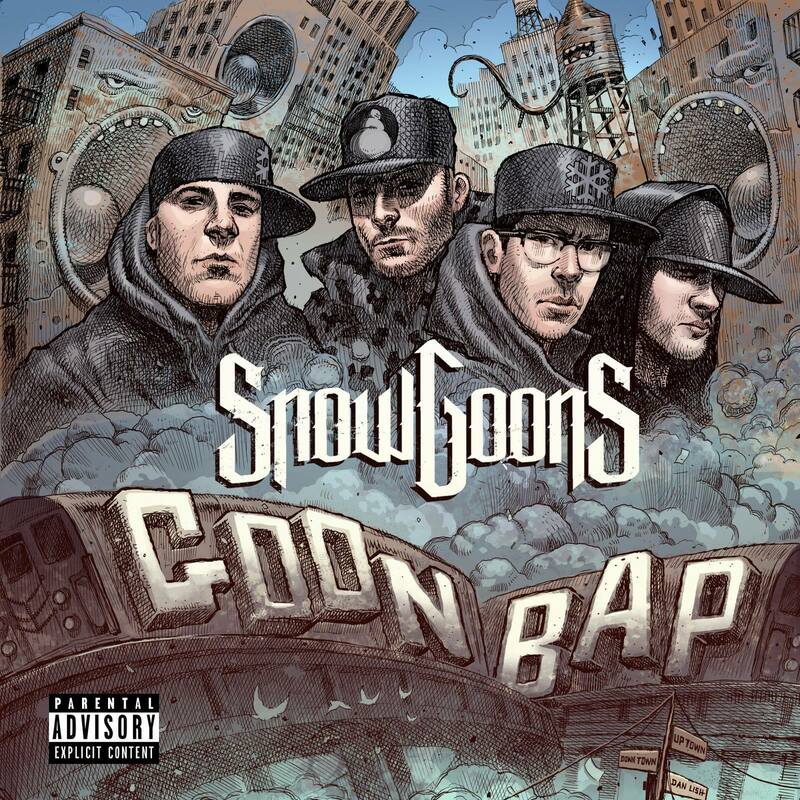 Snowgoons is known for dropping heavy BoomBap beats and we will surely hear those a lot on your new album. How would you describe nowadays' mainstream Hip Hop ? Illegal: Since I really am in my Hip Hop Bubble and not much listening to new stuff I just can say that I find it sad when they call somebody like Drake "Rap" or "Hip Hop" because all I hear is a dude singing like a popsinger. He dont even rhyme. But well, everybody has his own style and I just think mainstream Hip Hop's got nothing to do with Hip Hop. It's pop music and I maybe can enjoy that, but it has nothing to do with my music. Are you planning on making some trap beats yourself ? I know Det don't really like them so much, ahaha. Illegal: I think some trap beats are not bad. It's mostly what the Artist makes out of a track. If he wants to say a stupid lines like "I'm makin Money" 100 times in the song and use it as a hook, then a trap beat can sounds horrible. As you might not expect we have some new sounds in stores too. Obviously it will not go into the party sound. Trap ain't all wack. You just have to find the right sounds and make the right song. You guys travel a lot in Europe and in the US, is it difficult for you to keep up with your work while beeing on the road ? Illegal: Music is my work but yeah same problem. Once you're on the road, it's hard for me to run the label and do all the other work that comes with it. But then i have a strong team from the Goons to the Snowgoons DJs and further. Without them, it would not be possible to do what I am doing. And I can just say the same for Sicknature. He is still working as a teacher and working with young people. Sometimes we have to turn down shows and tours because we can't do them all for the love. As much as we want to be on the road, it must make sense for everybody. Most people dont realise what Artists sacrifce being on the road. Trust me it ain't all Party and Fun. The M.O.P vs Onyx campaign didn't go through back in 2015 (unfortunately) but you stated that you would relaunch it in 2016, what would change on this new campaign ? Illegal: We made many mistakes on Kickstarter for this project. But the biggest problem is that people think a campaign like this is like begging for money from the fans. Which is clearly not. Basically to make it simple, it is a preorder for the upcoming project. With all those pre orders you are able to finance a project and make it happen. People mostly don't understand the progress of a project like this and that's fine. They should just enjoy the music that comes out of it but ultimatly we still need the support from each and every one. We had to push this project a bit to the side but we will pick it up in 2017. If you could work with any MCS, dead or alive, who would it be and why ? How do you see the future of Snowgoons ? Illegal: I see a bright future because Snowgoons is a movement and we are not just a company seeking for profit. We love music and everybody following the Snowgoons movement can feel it. We got a lot of new music coming up after the Goon Bap album from Sicknature new solo album to a Snowgoons DJs album and many more collabos. Thanks a lot for this interview, it's a real honor for us to have you on OK-Tho. As a massive fan of you guys, myself and the team are more than looking forward to your new LP ! Shout out to anybody ? Thanks a lot too. It feels good to have support from people like yourself because we do all this independently. The love and support we receive is amazing. Big up to all the Hip Hop headz around the world. We All Keep Hip Hop Alive. Huge thanks to Dj Illegal for this massive interview. Here's the tracklist for their new album coming out on the 12th of December 2016.